Matchbook Casino – or MB Casino, as it’s more commonly known – is a part of the primarily sports betting platform under the name Matchbook. This platform has actually been an online entity since 2003, and with its evolution over the years, chose to also incorporate the casino site that is available today. Ensuring that everything is safe and fair, the casino holds two gambling licences – one from the Alderney Gambling Control Commission and another from the UK Gambling Commission. 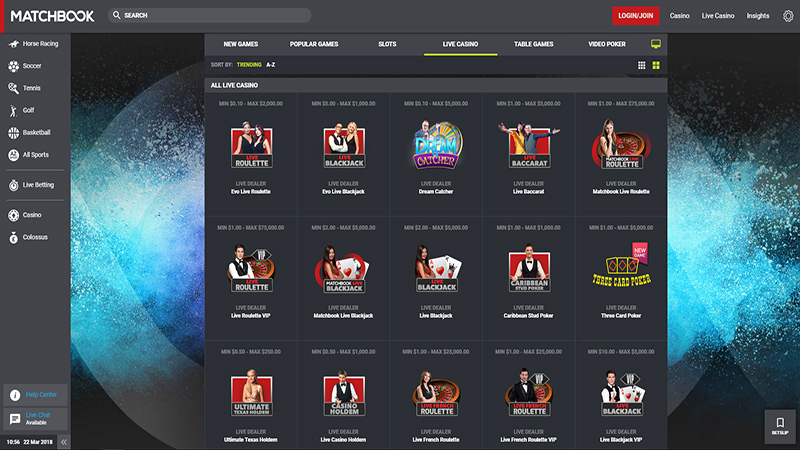 Additionally, the platform has a very appealing design, allowing for a visually enticing experience and an easy-to-use casino site on the whole. The MB Casino incorporates software from a small collection of developers into its offerings. Therefore, the lobby includes games from Netent, Evolution Gaming and Red Tiger, to name a few. This means that the casino is able to provide a truly inviting experience, thanks to hosting a nice collection of games. Plus, you can also guarantee that these games will be of the highest quality in themselves, thanks to the developers that provide them to the site. The lobby holds sections for players to access slots, table games, live casino offerings and video poker. The first of these categories is the fullest, featuring such titles as Asgardian Stones, Midas Gold, Rocket Men, Gems Gone Wild and Treasure Mine, to name a few. There are also some progressive jackpot offerings in this category too, like Cosmic Fortune and Divine Fortune. There’s a strong selection of 15 different live dealer games to access, while standard digital versions of these games are also on hand. This includes European Roulette, Pai Gow Poker, Red Dog and Progressive Blackjack. Finally, the section for video poker games is quite small, providing only four different options, including Joker Wild and Jacks or Better. 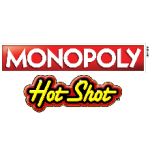 Joining the Matchbook Casino is very much appealing within itself, but you’ll find it to be even more so with the special offers that it provides. There are three different options open to newcomers, so once you complete your registration, you can begin claiming such. The welcome package encapsulates a total of $500, which is available with three different deposits. There’s a 100% bonus up to $100 for you to utilise on the site’s slot offerings. There’s also a 50% up to $200 available to claim on the casino’s live dealer games. And finally, a third one provides a 50% bonus up to $200 on table games. As a regular gamer at the casino, you’ll find a nice collection of additional promotions are available to claim too. These incorporate offerings such as further bonuses on top of deposits, as well as freespins to try out different slot games. Keep an eye on your email inbox to receive all of the latest information relating to MB Casino’s most recent special offers. Whenever you want to make a deposit at this casino, you can do so by utilising one of several different accepted methods. There’s the option of using the often-seen Visa and MasterCard products. Alternatively, if you’re more of an eWallet user, then Skrill and Neteller are also accepted. Additionally, you can use the PaySafeCard option if you prefer. As far as withdrawals are concerned, you don’t have the option of withdrawing back to a MasterCard or to the PaySafeCard option. However, the remaining other methods, as well as a bank wire transfer are available to utilise. You may come to a point of requiring some assistance while playing at Matchbook Casino. If this does happen, then you can take one or two different routes. First of all, the site does have a very comprehensive and informative FAQ section that you can browse through. Alternatively, a customer support team are also on hand for you to contact. They are reachable via Live Chat between the hours of 8:00am and 1:00am GMT every Monday to Sunday. Alternatively, there’s the option of sending an email along to them or calling on the telephone. The team are always friendly and provide as much assistance as possible. MB Casino has some very appealing features for members to enjoy, including a very impressive game lobby and welcome offer. The banking options are smaller than what can be found at many other online casino platforms, however this does cover the more used methods. 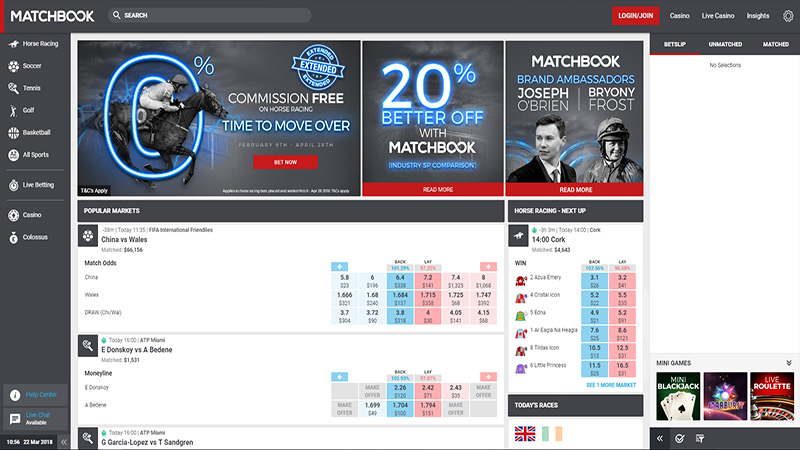 Furthermore, with such a nicely designed layout and the ease of use that the site boasts, Matchbook Casino is definitely able to stand out as a prime online gaming site. Play at MB Casino. USA Players Welcome!